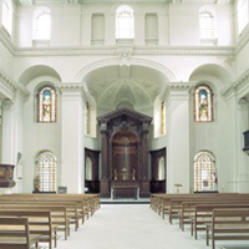 The Church St George’s Bloomsbury is available to hire for evening concerts and other events that are sympathetic to a consecrated building. Restored to Hawksmoor's original design, this magnificent Baroque space is at once grand and austere, spacious yet intimate. The body of the church is comprised of an open square space that has a highly reverberant acoustic of approximately 3.0" with audience. Its custom-made pews which can be set out in a variety of different seating patterns, each of which offers clear sightlines to the performance area for all members of the audience. The church and its facilities are highly suitable for chamber concerts, or for larger ensembles up to a maximum of 30 performers with an audience of 150 people per performance. Equipment in the church Performers may use the piano (1902 Bechstein 6' grand) and/or the electric organ (Viscount Prestige IX) by arrangement. The piano is tuned regularly. If you wish it to be tuned specifically for your performance however this will incur a fee of £75. We have 10 music stands, a conductor’s rostrum and a ‘cello box in the church that you are welcome to use. We have 55 chairs for performers stored in the north gallery inside the church and several trestle tables onsite. The galleries hold a number of theatre lamps that can be adjusted to a variety of settings for your performance. Audience interval refreshments Due to the restricted facilities available at St George's Bloomsbury we regret that we cannot accommodate interval refreshments for audiences that widely exceed approximately 100 patrons. For audience attendance below this number, however, concert hirers are most welcome to serve interval refreshments to their patrons. Please note that no refreshments are allowed in the main body of the church and that all refreshments must be served and consumed in the Upper Vestry Hall. For more information regarding interval refreshments please contact Mark Summerbell, our Arts & Concerts Director here. Upper Vestry Hall Built in the late nineteenth century, the Vestry House is a building of character and offers an ideal location for your event in the heart of Bloomsbury. The hall benefits from high ceilings and is flooded with light from windows at both ends.It measures 13m x 6.3m and seats 60 comfortably in any layout. It is let as a self-contained unit with two toilets (one wheelchair accessible), trestle tables and an upright piano. Use of a small kitchen and use of the adjacent Upper Meeting Room can also be booked if required. The entrance is in Little Russell Street and is accessed via a series of steps. Access for wheelchairs and pushchairs etc. is via the lift next to the south tower entrance of the church on Bloomsbury Way (notice required). The Upper Vestry Hall is available for hire year-round Mondays to Saturdays. Upper Meeting Room This is a small semi-circular room adjacent to the Upper Vestry Hall. It measures 6m x 2.5m and is suitable for small groups or as a dressing room for performers. Access & parking The church has an external lift in the front driveway entrance for disabled patrons and heavy equipment. Access is via the front left (west) driveway entrance in Bloomsbury Way. Parking for 1 vehicle is available onsite in the rear church courtyard off Little Russell Street.